A hungry traveller arrives in a village, and asks the people there if they have any food to share. They all say no. It is an all too common a story. This particular traveller, however, does not leave the village defeated and hungry. He does not go on to die by the side of the road – though countless others in his situation certainly have. Instead, he fills a pot with water, pulls a stone out of his travel bag and drops it in, and places the pot on the fire. One by one, the villagers come to him, and ask him what he is doing. He explains that this is a soup stone, and that he making stone soup, which he would be happy to share – and which would be even better with the addition of some small ingredient. The villagers, who not so long ago claimed to have nothing, each add a little something to the stone broth, eventually creating a feast together – one which they share. In case you never heard it before, the above is a boiled down version of the story of stone soup. I can still remember the first time my mother read it to me. Something about it moved me. The traveller was cunning, and the moral of the story resonated – but more significantly, I was amazed that that’s all there was to soup. I quizzed my mother to make sure I understood properly – that all you had to do to make soup was boil stuff. I was three or four years old, and am quite sure I’d never thought about where soup came from before. Soup, to me, was a rich flavored liquid, origins unknown, that warmed and satisfied on a cold day. And all you had to do to make it was boil stuff. That felt like magic to me. All these years later, the ability to extract the essence of foods, and to combine them into complex, layered flavors still feels like magic. For years, I started with whole vegetables and chickens, but have had better results lately using food that used to go straight into the compost or garbage. What I do is this: whenever I peel or chop vegetables or meats, I toss any bits that would usually be destined for the compost or garbage bin into a colander, wash them, then put them in a container in the freezer. When I want to make stock, I throw the stone-like frozen scraps into water and boil. I made the last batch with corn cobs, chicken wing tips, carrot greens, onion skins, celery and carrots ends, carrot peels and some cauliflower leaves and carrot tops that didn’t make it onto the menu a few weeks ago. It was complex with a hint of sweetness – and, in the spirit of stone soup, it was a broth made in what some would perceive as the absence of food. I used three cups “stone soup” broth to make one of my favorite soups – a spicy beer and cheddar soup. The final product really benefitted from the multitude of flavors in the broth, particularly the distinctive flavor of corn imparted by the corn cobs. Mix mustard powder into vinegar and set aside. Sauté the onion, serrano pepper and garlic in olive oil over medium heat, until onion is translucent. Add in the celery and carrots, and sauté for about five minutes. Add in the beer and stone soup broth. Bring to a boil, then lower heat and simmer for 10 minutes. Melt the butter over medium heat in a deep skillet, and whisk in the flour. Continue to whisk over medium heat for about 3 to 5 minutes, until the mixture starts to turn a light shade of brown. Whisk in the milk, and heat until the mixture starts to thicken. Stir in the cheese, and once it’s melted, pour the cheese sauce into the soup and blend. Add in the mustard mixture, and salt and pepper to taste. 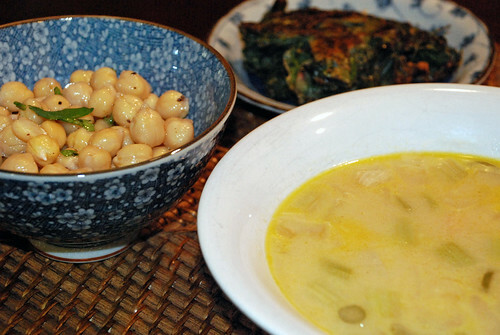 This entry was posted in Waste less recipes and tagged freezer, soup, stock, stone soup, sustainability, sustainable living by Jean-François. Bookmark the permalink. Stone soup has always been one of my favourite stories. I may take from your suggestion wrt freezing these odds & ends – it’s a great remedy to things going off before you’d be ready to make stock. I’m starting to make much more use of my freezer these days – amongst other things, it means that my stock gets made with a greater variety of ingredients and is more interesting. I have some beet peelings in the freezer now, and am quite looking foreword to seeing their effect on the next batch of soup. Had never thought to add corn cobs before, will definitely do that. I’ve started to freeze parmesan rinds as well to add to sauces and soups :D As for cauliflower leaves, if they’re really fresh the leaves can be stripped off the stalk and taste pretty good – sort of like a more refreshing version of kale. Great idea about the parmesan rind – will definitely start doing that. I think I’m going to need a bigger freezer soon. Another great idea! Why didn’t I think of that? Thanks. I only started doing this recently, and am surprised by how quickly the scraps add up. I end up making about 8 cups of broth a week as a result (and it’s different each time), and am finding lots of ways to use them. Glad you like the idea. It’s worked out well for us. I never buy stock anymore, and each batch has it’s own character. I read this post before dinner and already started to put scraps aside. Do you keep all the scraps whole or chop them? Would you keep spring onions rooty tips for the mix too? When you say onion skins, do you mean the “dry” skins or just the outer fleshy layers? How do you judge how much of the vegetable scraps you need to use to make a soup? – I chop the scraps coarsely, into big chunks (like the ones in the picture). – Yes, I keep the rooty tips. – The dry parts of the onion skin go straight into the compost. – I go by the size of my soup pot, which is about 6 quarts. So, when I have enough to fill it about 2/3 to 3/4 full (again these are bug chunks, so there is a lot of space for water between them), it’s time to make soup. Thank you so much for all the info!! can’t wait to try it! Approve this comment and we’ll spare an imaginary animal!